Commissioned as a gift to his city in 1893 by steel baron Henry Phipps, Phipps Conservatory, and Botanical Gardens is one of the nation's oldest and largest Victorian "glass houses." Silvered domes of glass enclose 13 garden rooms brimming with thousands of exotic plants and flowers. The 2.5 acres around Phipps continue the experience, filled with lush gardens, peaceful ponds, and sparkling fountains. A variety of permanent and seasonal exhibits at Phipps Conservatory make it worth many repeat visits. Highlights include the Palm Court with its garden railroad display, plus the Orchid Room, Desert Room, children's Discovery Garden, outdoor lily ponds and rose garden, and one of the premier collections of bonsai in the country. Don't miss the annual seasonal flower shows and Butterfly Forest. Most indoor rooms and outdoor gardens at Phipps are accessible to wheelchairs and strollers. The Welcome Center in the front of Phipps houses, The Shop at Phipps, a large gift shop filled with a wide variety of unique gifts for anyone who loves plants and flowers. Here you'll find horticultural books, bath products, educational games and toys, gardening tools and jewelry. They even have a nice variety of house plants, including orchids and bonsai. Across from the gift shop, Cafe Phipps is a pretty place to grab a bite to eat. Family-friendly menu items feature fresh, local and organic ingredients. Shopping and dining do not require admission to Phipps Conservatory. Phipps Conservatory is open seven days a week from 9:30 a.m. to 5:00 p.m. and until 10:00 p.m. on Fridays. Café Phipps and The Shop at Phipps are open during all Conservatory hours. Some seasonal events include special extended hours. Admission to Phipps is $15.00 for adults, $14.00 for seniors (62 years and over) and students (with ID) and $11.00 for children (ages 2-18). Phipps Members and children under two enjoy free regular admission. 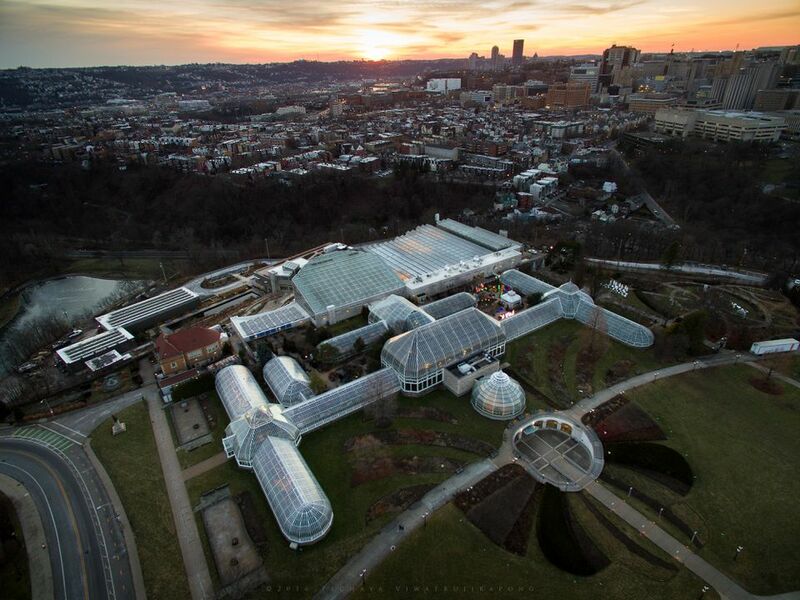 Phipps Conservatory and Botanical Gardens is located in the heart of Oakland on Schenley Drive in Schenley Park. It's on top of a hill and easy to spot. Take I-279 S to Pittsburgh. As you approach downtown, merge onto I-579 S (exit 8A) toward Veterans Bridge, following the signs toward Monroeville and I-376 E. Take the I376 E exit toward Oakland/Monroeville and follow until you reach the Forbes Ave./Oakland exit (exit 2A). Take the Forbes Avenue ramp and follow Forbes Avenue for about 0.7 miles. Turn right onto Schenley Drive and then left at the stop sign. Phipps is on the right after you enter Schenley Park. Take I-376 W (exit 57 off the PA Turnpike) to the Oakland exit (exit 3B), bearing right to the stoplight. Turn right onto the Boulevard of the Allies. Go through two stoplights and over the Anderson Bridge. Turn right at the second exit into Schenley Park. This will take you under the Anderson Bridge and over the Panther Hollow Bridge. At the fork in the road, bear left into Schenley Park. Phipps is on the left. Take I-279 N toward Pittsburgh, to the Fort Pitt Tunnel. If you're coming from the West, follow Route 60 to Routes 22/30 E to I-279 N. As you approach the city, get in the right-hand lane going through the tunnel, and after exiting the tunnel take the right-hand ramp, following signs to Monroeville and I-376 E. Exit at Forbes Ave./Oakland (exit 2A) and follow Forbes Avenue for about 0.7 miles. Turn right onto Schenley Drive and then left at the stop sign. Follow Schenley Drive into Schenley Park. Phipps is on the right. * Alternatively, take PA-51/Saw Mill Run Blvd north, then take the ramp toward I-579 (Downtown/South Side). Turn right onto West Liberty Avenue and follow through the Liberty Tunnels. After going through the tunnels, take the Blvd of the Allies ramp toward I-376 E exit, and then follow the directions above. Follow Route 60 to Routes 22/30 E to I-279 N and then follow directions from the South (above). Parking is available free of charge in the center island in front of Phipps Conservatory. You'll need to give someone at the admissions desk your license number when you arrive. There are also metered parking spaces located in front of the Conservatory.